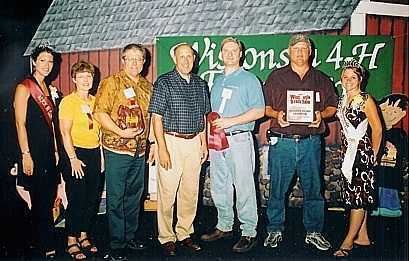 Governor Jim Doyle, David Mauer and John Hamm of Wisconsin River Meats, Mauston; and Fairest of the Fair, Sheri Nelson. Landjaegers are a dry snack sausage that originated in the Glarus region of Switzerland. 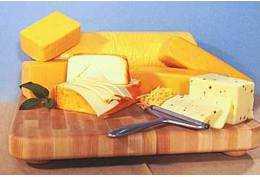 Swiss immigrants brought this recipe with them when they immigrated to New Glarus, in Green County, Wisconsin in the 1880's. In the late 1970's, John Hamm attended and graduated from the All Around Butcher program at Southwest Tech. He was trained in making Landjaegers, in the southern Wisconsin style, by master sausage maker Mr. Warren Gregory. John brought the recipe back to Mauston and modified it for local tastes. John gave away lots and lots of samples of the Landjaegers. They were a big hit! There were many a naysayer however, who said they are ugly and would never sell. That was hundreds of thousands of pounds ago! Today they are Wisconsin River Meats' best selling item. We also make venison landjaegers for hunters and they are also a big hit. 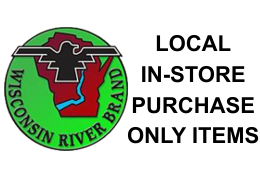 In the summer of 2007 for the first time Wisconsin River Meats entered product in the Wisconsin State Fair. We were pleasantly surprised when the State Fair announced we had won Reserve Grand Champion for our Landjaegers. We were awarded our prize by Governor Jim Doyle and Alice in Dairyland. Our winning entry of three pounds was auctioned off for $500.00. The money from the championship auction was donated by all of the winners to the Wisconsin 4-H Foundation. So, please give our award winning landjaegers a try! We think you will enjoy them. Wisconsin River Meats offers many varieties of sausage and specialty products available both retail and custom processed. We truly offer something for everyone and we offer varieties for every meal or occasion. We also vacuum package all of our sausage products. This locks in freshness and makes such nice looking packages. 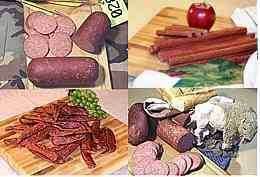 Click Here to read about Wisconsin River Meats Summer Sausage. Browse through our product categories. The history of Sausage making is an amazing journey. Paintings of early Chinese Kitchen scenes (500 B.C.) depicted sausage making. Surviving Greek and Roman sausage recipe manuscripts give us general manufacture and spicing details. Homer mentions sausage in the Odyssey. Sausage making is one of the oldest and most widespread forms of food preservation. The Babylonians recorded that King Nebuchadnezzar enjoyed sausages similar to modern salami. Smoking was, and still is one of the most popular methods of preservation. Sausages are considered the earliest convenience foods. Sausage making in Wisconsin was brought over by immigrants and then grew regionally over time. 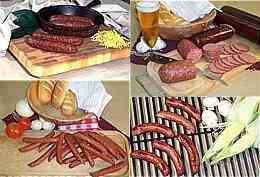 Wisconsin can proudly claim it is Americas most sausage produced State. Wisconsin River Meats makes many "convenient" type sausages reflective of a proud past as well. Our sausages are coarse ground which always shows the quality of the product and gives the sausages a grand meaty taste. Our spice recipes are our own and time tested, many coming from our families. Homemade and hand twisted still today we only use natural hickory in our smoke houses. We stand tall behind the quality of all our products and once you try them for yourself we believe you will as well. Thank you for your patronage. We appreciate your business. Service Area: Mauston, Wisconsin Rapids, Sparta, Portage, Waunakee, Reedsburg, Black River Falls, Nekoosa, Lodi, Montello, Pardeeville and surrounding communities. 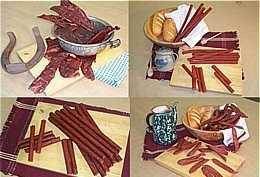 Page Summary: Wisconsin River Meats offers ring bologna, venison snack sticks, beef jerky and more for Baraboo, Sparta, Tomah, Reedsburg, Madison, Prairie Du Sac, Sauk City, Lake Delton, Wisconsin Dells and surrounding Juneau County Wisconsin communities.